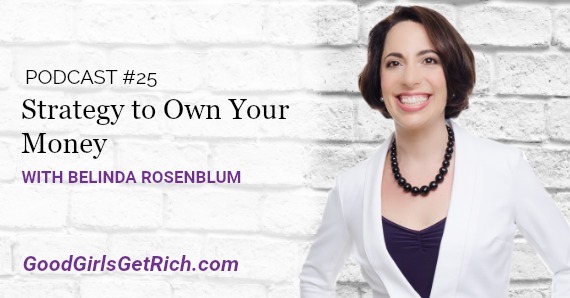 This week, Good Girls Get Rich features, guest, Belinda Rosenblum, co-author of “Self-Worth to Net Worth” and “12 Keys to Creating Wealth Inside and Out”. She is a CPA and Wealth Expert who takes the fear and worry out of money. Belinda is somebody who walks her talk. She works hard to be authentic. Co-author of a book Self-Worth to Net worth and 12 Keys to Creating Wealth Inside and Out. Belinda Rosenblum is helping thousands of people discover how “owning your money” creates certainty, security, and the life of financial independence they deserve. Belinda is the President of OwnYourMoney.com, a financial coaching and education company teaching individuals, couples and business owners how to make personal finance and small business success rewarding, manageable, and profitable. Tracking and Spending – Do something to earn more money, not necessarily work more, but work smarter. [30:50] Use a spreadsheet to track where exactly your money is going.